Yep, that’s Chico’s designation in a recent edition of Bicycling magazine, and no one here would argue with that. To say that Chico is “Bike Friendly” is a major understatement. Some folks bicycle because it’s good for them. Some do it because it’s good for the environment. But we think most folks bicycle because they simply love it. 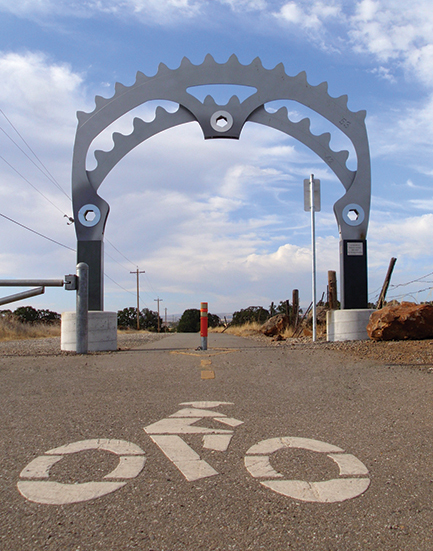 Whichever category fits you, Chico’s a great space for bike riding in or out of town. Besides the Bidwell Park paths and multiple other paths in Chico, you can head out of town in almost any direction and have a good ride with great scenery. Bike trail maps are available at the bike shops in Chico and at the Chamber office. One ride you shouldn’t miss is the one that parallels the Midway, just off of Park Avenue. In addition to being a nice ride on a paved surface, it features the 2004 mural by Mabrie Jeanne Ormes and Scott Teeple. Commissioned by Chico Velo and the City of Chico, this mural is entitled “Celebrating the Wildflower Century Bicycle Ride.” The mural notes a special thanks to Barbara Castro (botanist), Mike Peavy (pilot), Rocky Niles (owner of Corlin Paint), and Classic Golf Car. The Steve Harrison Memorial Trail, off 20th Street past Bruce is growing in popularity. Look for the giant archway. Another popular, but somewhat strenuous, trek for cyclists is the 10-mile ride to Forest Ranch. Just take Ninth Street east, which will become Highway 32. Lots of pine trees and a couple of shops will greet you upon arrival.